Recently I was invited to deliver a special speech at a conference in Hyderabad, which was mostly attended by the packaging, packaging technology experts and packaging industry owners. I was to speak on “consumer trends” and preferences. (put the detail of the conference here). I reached the hotel in the evening before my speech and chatted up with Deepak Manchanda, expert and consultant to the event. I gave me a few tips on what i should speak on. He suggested that i should speak on how packaging industry needs to brand itself (since i am a branding expert). This made sense to me and i spent the night in creating a new Prezi on this topic. I was glad i did not speak on technology preferences, consumer trends from sale point of view, since almost every speaker who spoke after me was an authority on the topic. I learnt so much about Track and trace systems, and about counterfeiting Industry, about scaling of packaging industry. It is scary to know that 40% of medicines and milk packaging is adulterated, one of the biggest concerns of consumers, when you talk about packaging is “Environment” and it is catching up in India. 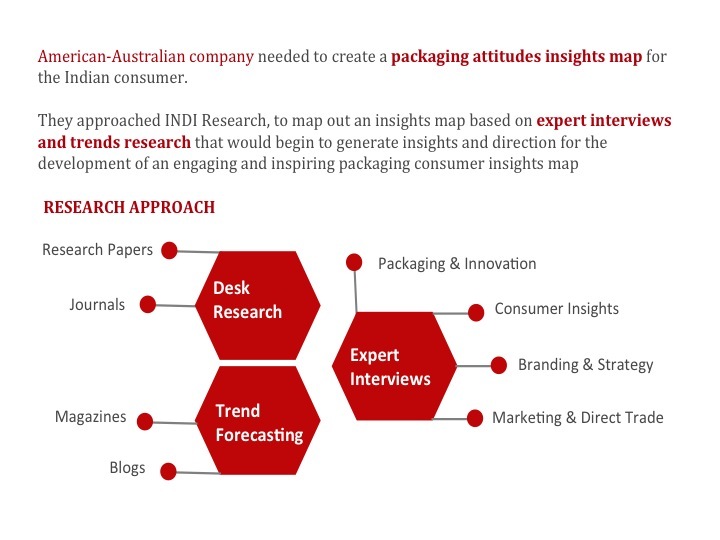 This is where I find a niche for Indian packaging Industry to brand itself and grow exponentially. Indian packaging Industry is about 11% of the global industry (that is not small) and is growing at the rate of 30% or more year on year. Not surprising, given that it is a fast growing and emerging market. Most of the packaging companies are small, micro and big ones all have investments from worlds largest companies. There is not much investment in R&D, and focus is all on growth thru volumes. So machines, people, spaces and geography are leading this Industry right now. It is obvious if the Industry comes together and takes lead in environmental issues with packaging, it would set a bench mark for the world. In global terms it is a small industry, in growth terms it has probably the biggest potential. A stand that this industry would only grow on the foundations of responsible design and green materials will make the global leaders to sit up and take notice. It is also not far fetched to evolve R&D that is indigenous and around green principles. There is a lot to gain, India could easily be positioned as the green packaging industry for the world. I am now on the other side, where I receive resumes and have to screen those – sometimes send a lovely mail saying when can you join us and sometimes just saying a plain, simple no…. The learning comes from what and how I felt then; that I would never want any hopeful recruit to feel because of me. While I was thinking about this, I realized that wouldn’t this be an act of ‘practicing practical empathy’? 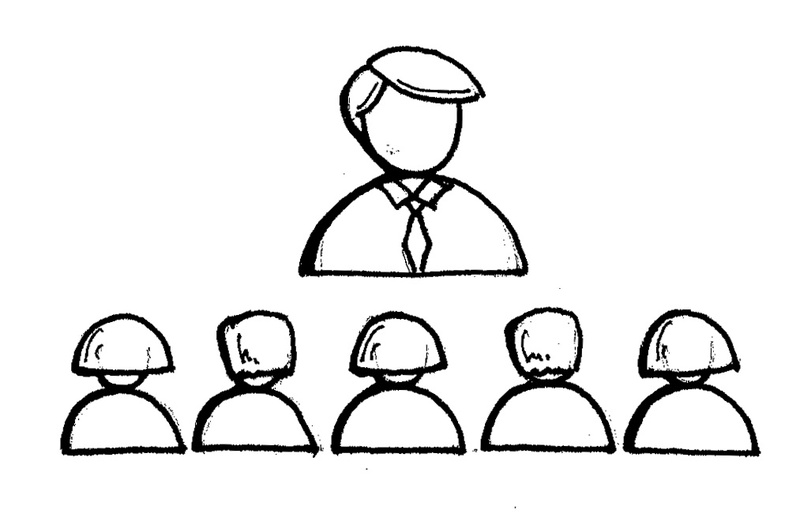 Be transparent: Praise the applicants for their great work and give genuine feedback too. Suggest them other suitable options if you cannot accommodate them in your agency. Always leave that window open: Stay connected even if you don’t end up working together. The world is so close today and the design research community is so small that the chances of you running into each other are almost certain. Reply!! This needs to be the next priority after the project deadline, because there is someone hopeful awaiting your reply. 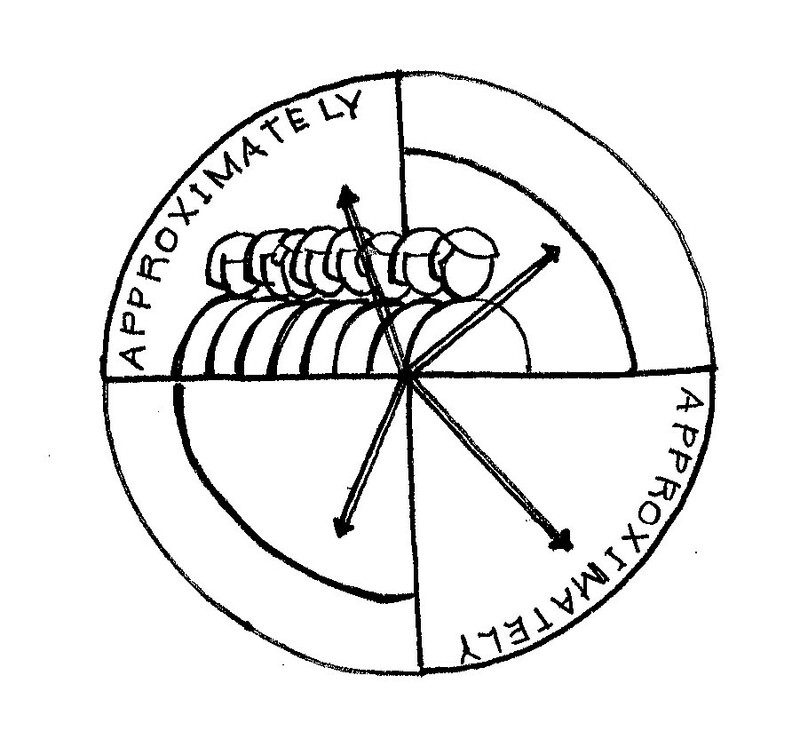 Acknowledge the receipt of mail and complete the communication loop. Yesterday, I was on a Indigo flight from Bangalore to Pune…and I had a ‘seepage experience’. 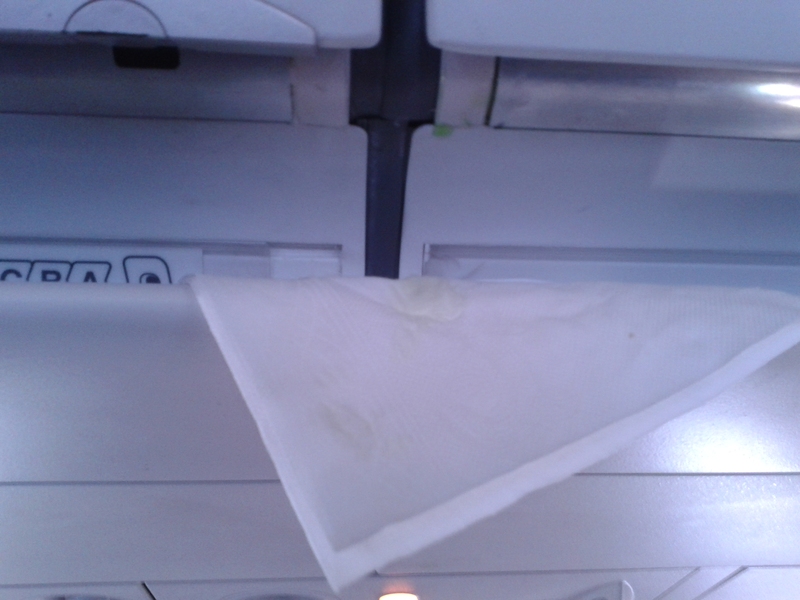 I walked to my isle seat (12C) and as I was about to be seated I saw a tissue sticking out of a slit below the cabin – which was later binned after sorry’s from the air-hostess. When the flight took off – from that very place there was some green liquid leaking right on my face! That dripping went on till we were straight up in air and cruising…luckily there was one empty seat in the last row which I later occupied. I was disgusted initially, but then I was also a little skeptical about the safety measures that the airlines claim to make. The flight route was Kochi – Bangalore – Pune – Delhi; and to meet the promise of ‘being on time’ the airline hadn’t checked the seepage with the service engineer at the Bangalore airport and don’t think they did that at the Pune airport either. What kind of experiences are the customers paying for? And what safety measures are compromised on? If this was an experience on the award winning Indigo airlines then I wonder how bad Air India must be to be ranked world’s 3rd worst airlines. 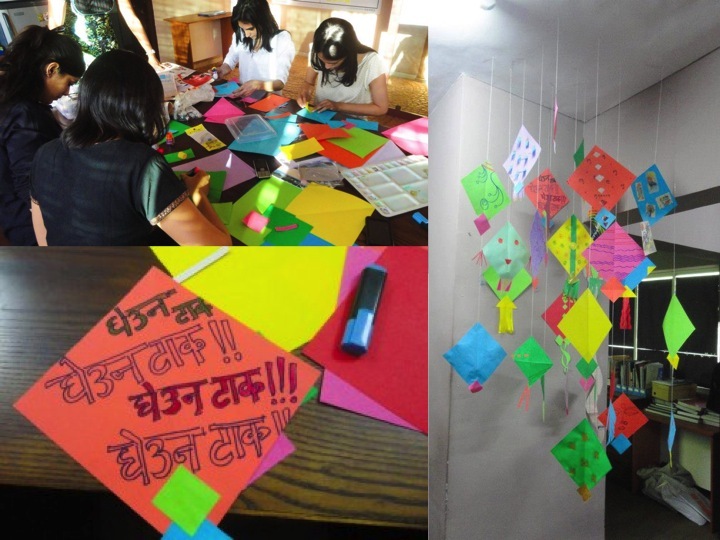 On the occasion of Makar Sankrant (harvest festival), we decided to make kites for the studio. It was a fun activity to get back to sharing and using paints, scissors and coloured paper. It also ended up being a learning / adding knowledge activity. In Gujarat people fly kites as adulation to the Gods – the scientific reason being that the human body needs sunlight and this is the best way to celebrate a festival outdoors and get some sunlight while flying kites all day long. In Maharashtra people wear something black on this occasion – the reason being that this festival falls in the peak of winters and black absorbs heat and keeps you warm in the winter season. There are many scientific reasons behind the traditions we follow blindly and I am going to attempt to unearth these through simple everyday stories and happenings around me. I attended a two day International conference/workshop on Storytelling and the theme was ‘Regional Stories – Colours and Textures’. What really struck me was that as English becomes a universal language, the death of regional languages is soon nearing. There are a few regional stories that cannot be translated into English as the essence is lost. But if the theme is universal then the story is understood – like the thirsty crow story which tells the kids to never give up and keep trying or little red riding hood story which teaches the lesson, do not talk to strangers. This workshop just got me thinking that isn’t there a story everywhere? I reach my workplace and tell my colleagues you know today while driving, there was a cow that was sitting right in the middle of the road and how there were people who were feeding the cow in the middle of the road instead of trying to move her. Or when I return home and my mother fills me in with what happened in her day at school and how a standard one kid made a beautiful painting which featured her as his favourite teacher. We are surrounded by stories. And this is true even in our professional lives – a good story will always get your customers/clients/stakeholders attention. 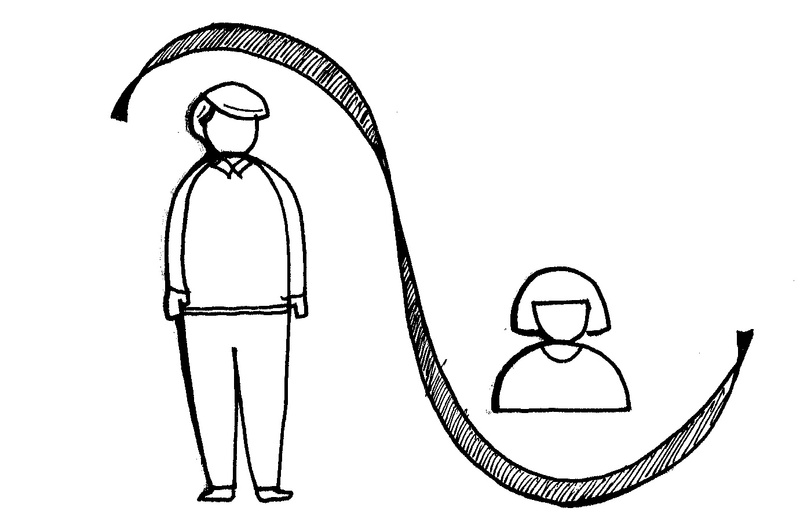 For a story to reach the audience, involve them – make them characters within your story so that they can relate to the story. 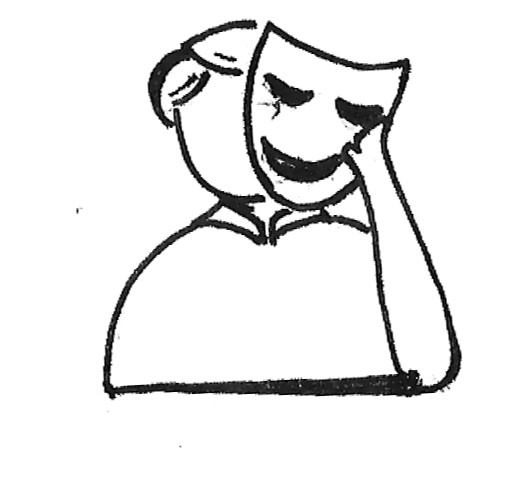 Narrate a story like a performance on stage and not like a paper reading on a podium. A story is a little nugget of wisdom; and for knowledge to become wisdom, there needs to be understanding. 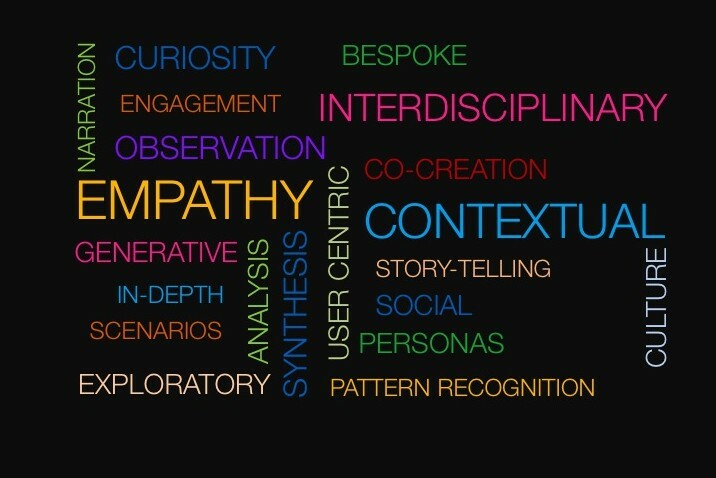 Storytelling is an art…it is an essential skillset for an ethnographer – if you cannot tell stories about people to people, then what purpose does your research meet? 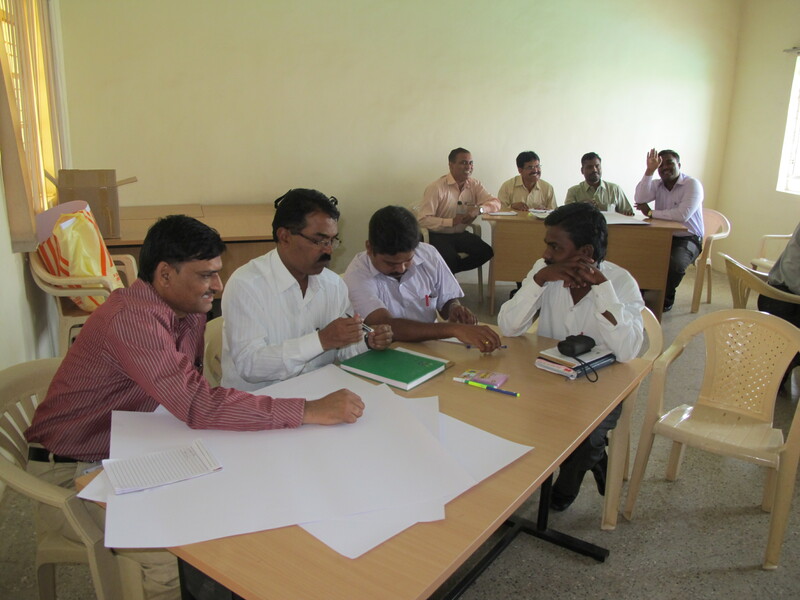 Team INDI conducted a design thinking workshop with educationalists associated with schools and a agriculture university in Baramati to give them an overview into how design thinking can help them ideate for new opportunities within their respective departments. 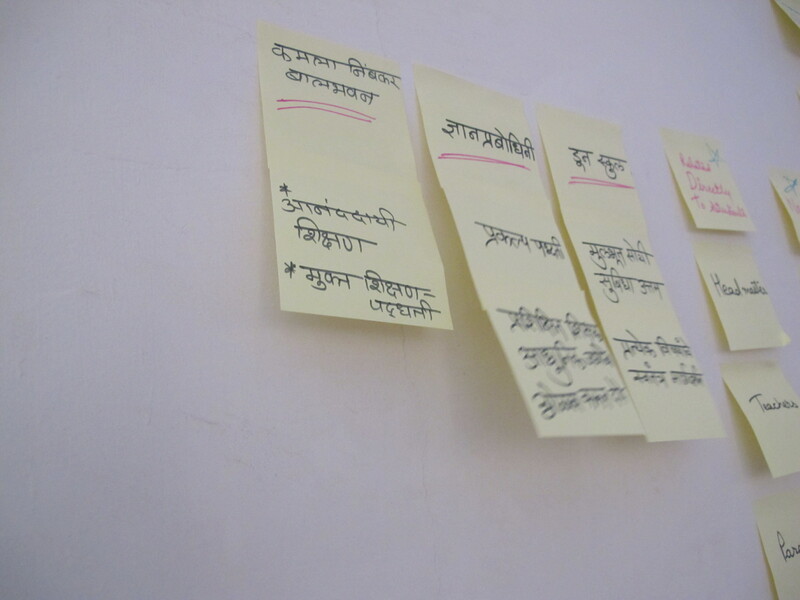 The first half of the day was about design, design process, design personality and myths about design. 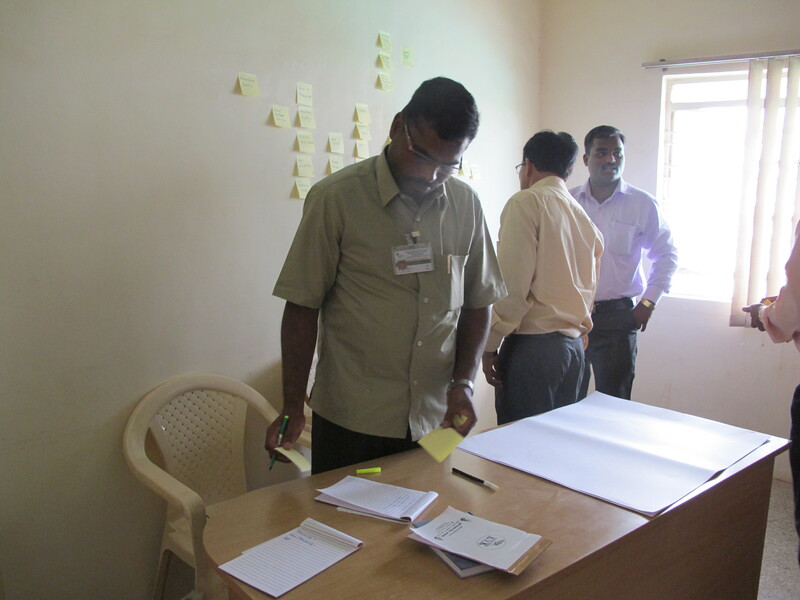 The second half was a hands on experience in a team activity. One of the tools we used was the ‘Stakeholder Tool’ where the attendees were encouraged to see things from the other side… a different perspective. It was challenging to make people leave their comfort zone and do something they had never tried their hand at. Examples work wonders! 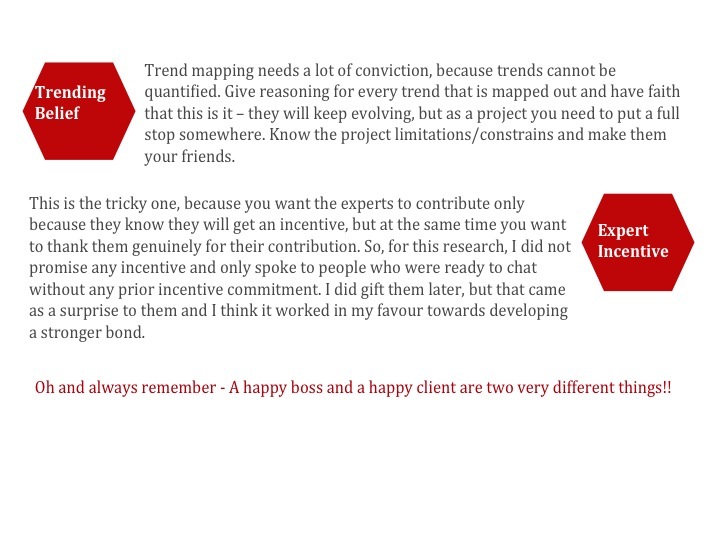 Spend a considerable amount of time on looking for right examples – well-planned presentation is half the battle won. 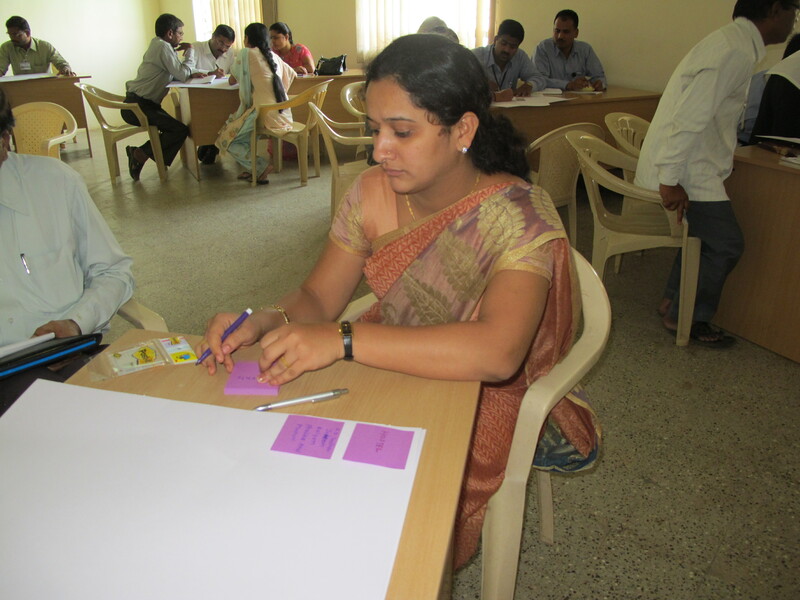 Post it notes facilitate team work and generate enthusiasm within the team. The fact that they can be moved from one spot to the other fascinated our attendees. 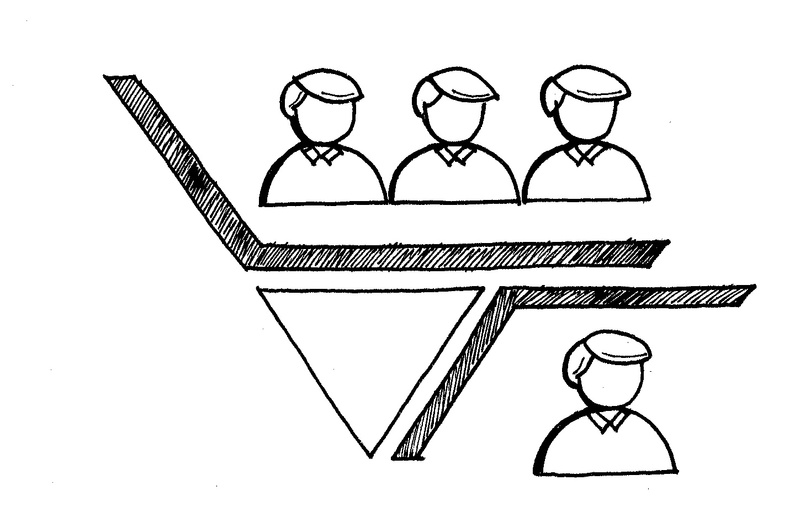 Presenting ideas in front of an audience gives every team a sense of ownership. 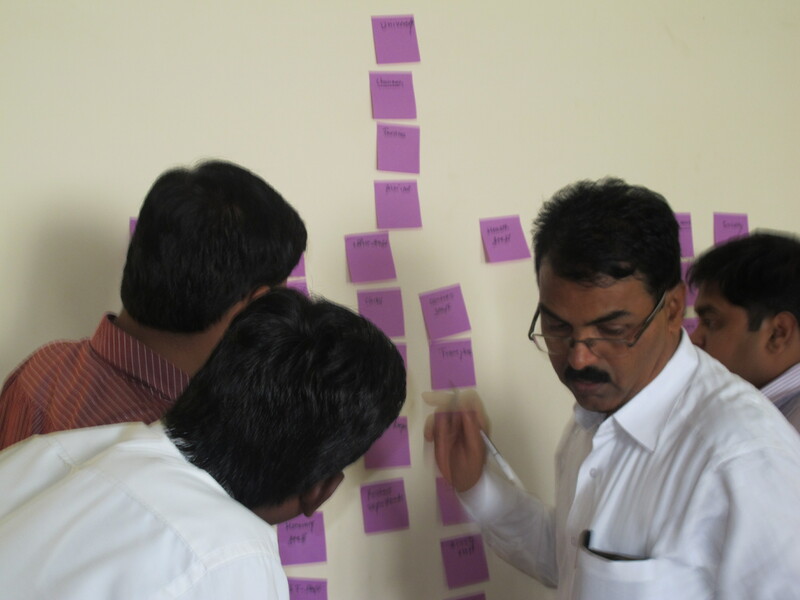 This also leads to discussions and challenges the team members to think holistically. Workshops need a LOT of time planning and even that seems little – workshops just have the tendency to run over and that is something that is beyond your control – act smart on the spot and club steps to get to the end goal. Make changes spontaneously and take things under control. Keep your audience in mind and design the activities accordingly. A step by step approach could work for some while others could demand for something more holistic. 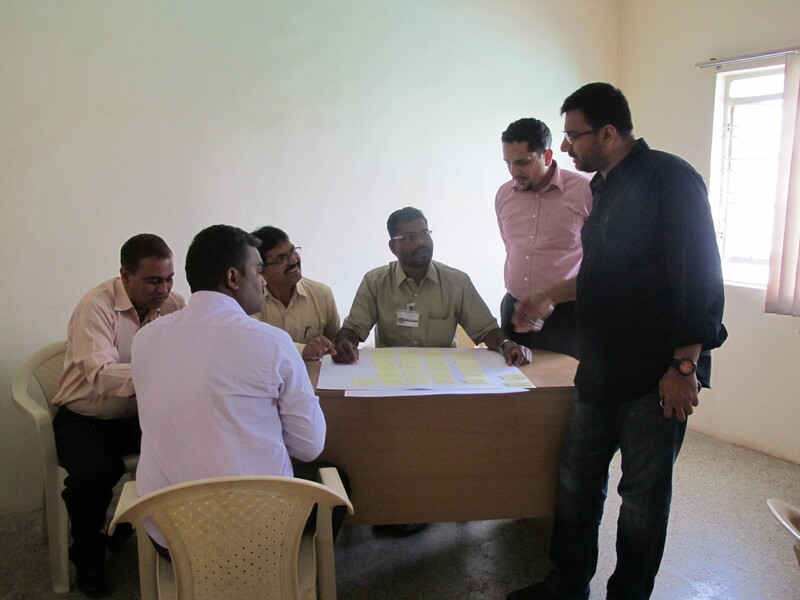 This being a workshop in a rural area the approach was directive, but it helped because we were not looking for path breaking ideas or blue sky innovations! 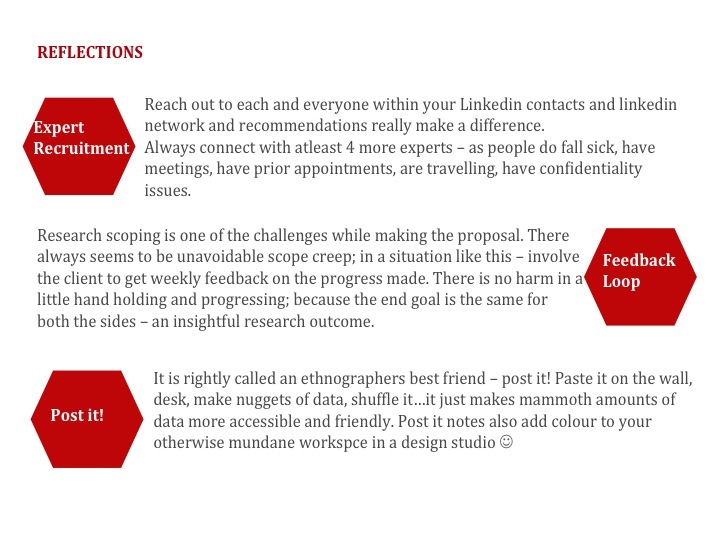 What is User Research, really?